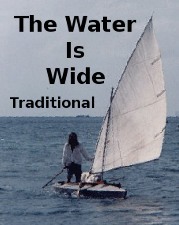 A traditional song that has always been a favorite, a simple song that I relate to both as a romantic who has long searched for someone to share a life with, and a traditional sailor with an old rowboat that I built, designed to carry two. When I first played this song, decades ago, I did it in a dreamy a-temporal rhythm like slow waves on a beach, singing in slow, romantic poetry. The one day at the Alaska State Fair, a few years ago, I suddenly found myself starting to drive the song, and drive it hard, with all the pent up longing of a lonely life, with the force of a storm at sea, and the momentum of a ship plunging through those waves in a smooth yet driving rush of sound. It is like the the sound of a ship sailing a across the waves, not in a wild storm, but in the great smooth waves afterwards, the rushing fast sound of wavelets breaking along the bows and sliding back to the stern, all contained in the slow rhythm of the rollers as the ship crests them and then glides across the trough. Now I play a version that combines both, starting out slow, then switching gears to the driving version, then summing it up at the end. And for all its simple words, and I do a more modern, probably New England version, they have come to mean so much to me, like singing of a woman who can row, one who can be a partner, take her share of the load, and stand on deck beside me to face what the sea brings. Not bad for an old song. This entry was posted on Friday, May 1st, 2009 at 8:55 pm	and is filed under Music. You can follow any responses to this entry through the RSS 2.0 feed. Both comments and pings are currently closed.